“Uh-oh, pee pee in my pants!” will most likely become a joke around your household. Often, Sensory Processing Disorder (SPD) and difficulty in potty training go together like peanut-butter and jelly. might take a little longer to toilet train depending on their sensory needs. Remember, the body has five senses: vision, hearing, smell, touch and taste, and each sense is integrated into our bodies differently. In addition, the body has a sensation known at interoception, which refers to your “body centered” functions that require no conscious thought. These are necessary life functions including heart rate, hunger, thirst and digestion, state of arousal, digestion and bowel movements. Children with sensory processing disorder maybe over-responsive (sensory avoiding) or under-responsive (sensory seeking) to one of more these sensations, leading to different manifestations of difficulties with potty training. Is can be difficult to determine what is the most efficient way to help your potty training child with SPD. Remember to go at your child’s pace for potty training. Allow your child to develop the skills to become physically and emotionally ready by providing positive reinforcement. Avoid punishing your child or criticizing them in their efforts to learn, no matter if your child is 2 or 6 years old. Prepare your child by reading a toilet training book. Children learn well with visual supports. Books like Once Upon a Potty written by Alona Frankel provide humorous visuals for both boys and girls. Sesame Street had made a video titled Elmo’s Potty Time that eases a child’s toileting anxiety with songs and rhymes. Prepare the bathroom for sensory sensitive children by provide soft lighting, soft toilet tissue, and making the bathroom as quiet as possible. For sensory seeking children, provide bright light with fun music. Be aware of the techniques that help calm your child. If your child enjoys deep brushing or hugs, provide these prior to sitting him on the toilet seat. Provide a padded toilet seat for your child to combat tactile sensitivities to cold temperatures as the seasons change. As your child transitions from pull-ups to underwear, be conscious of seam placements and the material of the underwear. Give your child a fun experience by allowing him to choose which underwear to buy– after all, clothes (even the ones that are not seen) should be fun! For a child who has difficulty in feeling the sensations of needing to “go”, encourage him to use the toilet on a schedule (start with every hour). Provide positive reinforcement for your child trying! If your child is anxious about the automatic flush in public restrooms, cover the sensor with a post-it note to eliminate scary surprises. As a parent, potty training can be one of the most frustrating times of your child’s development. Just remember, your child is learning from and with you! Looking to help your child with SPD succeed in school? 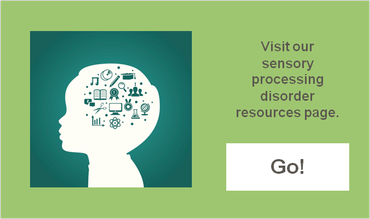 Register for our FREE Live Webinar | Sensory Strategies for School Success on November 17th.